Experience the full potential of Additive Manufacturing! 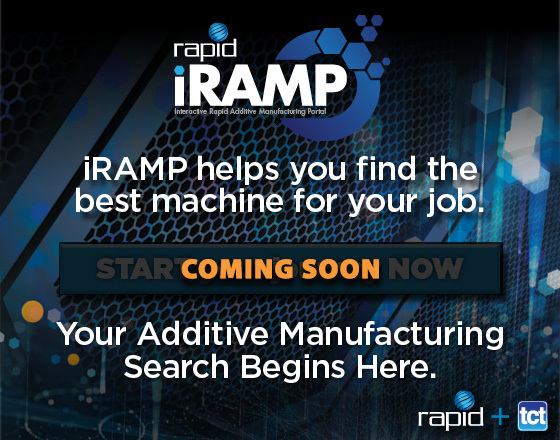 The Interactive Rapid Additive Manufacturing Portal (iRAMP) is a tool that supports critical additive manufacturing (AM) decisions. It allows users to make informed decisions when considering a purchase of an AM machine/3D printer. More than a searchable database, iRAMP allows users to specify the build envelope, material category, and more to find the AM machine to meet their needs. iRAMP saves users time and money by narrowing their search for AM/3D printing machines to only products applicable to their specifications. "Carbon and Riddell: Bringing Innovation to Head Protection"
Carbon and Riddell have partnered to bring customized, digital design innovation to head protection through Riddell’s new Diamond helmet platform. Join Erika Berg and Vittorio Bologna to hear about the recent breakthroughs in software, hardware and materials that make the Diamond platform possible. Berg will highlight the product development journey between Carbon and Riddell that led to this impressive new helmet. Bestselling author Bill Taylor, co-founder and founding editor of Fast Company, shares lessons and case studies from industry’s most successful digital disruptors and the world’s most effective leaders. He shows manufacturing leaders the new rules of success as they master the challenges of innovation at RAPID + TCT Keynote Lectures. "AM: Leveraging Design Capabilities for Production of Healthcare Devices"
Dr. Murray will share her experiences highlighting how AMagine, Stryker’s proprietary approach to implant creation using additive manufacturing has made possible revolutionary design freedom. She will also share her experiences about how additive manufacturing can be used in many situations from prototyping to product manufacturing. "Shaping New Ways for Smart Automotive Production by Using AM"
Additive manufacturing (AM) is entering high volume markets like automotive production at BMW. During this Session, questions will be addressed on how new business models can be realized or how automation and AI will help increase the implementation of AM in or near assembly lines with real examples of current use and an outlook of future developments. The purpose of this panel is to share broad and interesting trends that could impact almost everyone in attendance. Topics include: 1) The importance of design for additive manufacturing, 2) Justifying the cost of AM for production applications, 3) Challenges associated with post-processing and post-process automation, 4) Scaling AM technology across multiple locations, 5) Managing growth, 6) AM knowledge and skills development, and 7) Anticipating future developments. "Leveraging Additive Manufacturing for Enhanced Productivity: The Manufacturer’s Perspective"
Traditional factory processes have been fine-tuned over the years for process repeatability, part durability, workflow efficiency, and low operational costs. Today, new marketplace demands are pushing industry to increase speed and agility, and competitive pressures require rapid product development and shorter production cycles. ALL OF THE LATEST 3D TECHNOLOGIES.